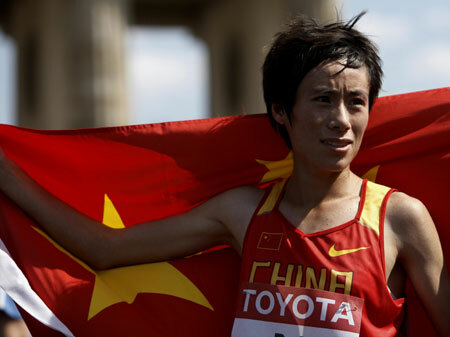 Bai Xue became the first Chinese to win a marathon race at the World Championships Sunday. The 20-year-old Bai pulled away from Japan's Yoshimi Ozaki in the last kilometer to finish the 42.195km race in two hours 25 minutes and 15 seconds. Ozaki took silver in 2:25:25 and Aselefech Mergia of Ethiopia finished third in 2:25:32. It was also the first gold medal for China in Berlin, taking its medal tally to 1-1-2. Bai, who was born in northeast China's Heilongjiang province, put an end to Chinese women athletes' 10-year-old gold drought in the world championships. 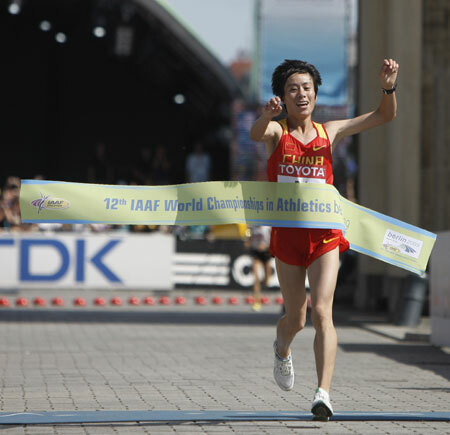 Liu Hongyu won the last gold medal in the women's 10km walk in Seville 1999. She is also the second Chinese to win a major international marathon after Zhou, who took the London Marathon title in 1997. "This was my first time to take part in World Championships and my only second time to take part in an international marathon. I am very happy to be the champion," said Bai, who won the Beijing marathon last October. "I had not pressure and was very relaxed. When I came here I did not think at all I could win the gold medal." She said she would try to win the gold at London Olympics. Zhou, silver winner in Osaka 2007 and bronze medalist in last year's Olympics, was fourth in 2:25:39. Another two Chinese runners Zhu Xiaolin, fourth finisher in Osaka, and Sun Weiwei, finished fifth in 2:26:08 and 2:29:39 respectively. Zhou was the favorite after twice winner Catherine Ndereba of Kenya, and 2005 champion and world record holder Paula Radcliffe of Britain did not enter the race. Zhou and Zhu stayed in the leading group until 30km where Bai, Ozaki and Mergia sped up. The trio exchanged lead for several times before Mergia dropped back. Ozaki led for a few minutes and then Bai overtook her to cross the finish line first in front of Berlin's historic Brandenburg Gate.